Engineered with a series of unique components and more than 11 key product features. An innovative design that combines several unique components along with many product features. Versatile frontal and rear oversized fall attachment points. ErgoArmor back shield protects from snap hook and lifeline injury. Knitted mesh membrane for optimal air circulation and comfort. Ergonomic PivotLink allows greater hip rotation and mobility. Web finials provide quick webbing adjustment and organisation. Hybrid, with strong and durable DuraFlex/DualTech webbing. 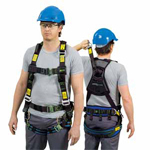 A versatile harness with front and rear connections, ideal for work positioning and confined space rescue. Rear 300mm D ring extension and frontal fall arrest attachment. Pelvic D rings for work positioning & confined space rescue loops. Adjustable chest, waist, shoulder and leg straps. Lumbar, buttock padding, and mesh membrane add comfort. Quick adjust, comfortable, durable Polyester/DuraFlex webbing. Donning made easy with two-sided, contrasting colour webbing and textures. Webbing engineered with shape-retention memory for a more comfortable fit. Clip-on design organises webbing after adjustment. WConstructed of durable, high-impact resistant polymer. UProvides positive gripping surface for easy web adjustment. 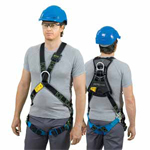 Easy, one-hand adjustment/release allows simultaneous adjustment of shoulder straps. Promotes snug fit; will not slip or misadjust. Unique rotary design provides greater comfort in bending/mobility. Better ergonomic fit with unique hip rotation point. Independent adjustment of upper and lower torso. Provides attachment point for belts/tools/accessories. 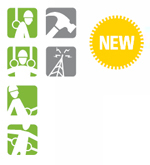 Integrated pack encapsulates labels minimising damage and loss. Positioned on the chest for easy access. Self adhesive label with write in window. Four brightly coloured, permanent labels allow customisation for date of service, specific trade, sub-contractor, etc. Semi-flexible back shield minimises impact from sharp/ heavy snap hooks and self-retracting lifelines. Self-adjusting channels conform to various body shapes. Knitted mesh membrane minimises moisture absorption and maintains optimal air circulation. The oversized back D-ring minimises "false" connections. Modular attachment design provides connection points for belts/tools/accessories. Attach/remove accessories for comfort & convenience. Designed to distribute the weight of accessories across the hips and shoulders for comfort and mobility. Accessories include: Phone and water bottle holders, bolt and bull pin bag, nail & tool pouch, and shoulder/leg pads.